We present the fifth part of Henri de Villiers’ article on the Lenten stations observed by the church of Paris, in an English translation by Gerhard Eger. The French original was published on the blog of the Schola Sainte-Cécile; since it is fairly lengthy, we have broken it up into six parts, each covering the stations celebrated that particular week. See part one for a general introduction. 11. Monday of the Fourth Week of Lent: station at the collegiate church of Saint-Germain-l'Auxerrois entre le Louvre et le Pont-Neuf (Sanctus Germanus Antissiodorensis inter Luparam et Pontem novum). A first church is said to have been built on this site during the several Parisian visits of St Germanus, who was bishop of Auxerre from 418 to 448, and who confirmed St Genevieve’s vocation. The church was rebuilt in 540 and placed under his protection by King Childebert I and Queen Ultragotha. A second reconstruction was ordered by Chilperic I, but the assassination of the king in 584 left the work unfinished. This 6th-century church had the shape of a rotunda, and was hence known for a long time as Saint-Germain-le-Rond to distinguish it from the abbatial church of Saint-Germain-des-Près on the right bank of the Seine, which kept the relics of St Germanus of Paris). This old church was destroyed during the Viking siege of Paris in 885-886, then rebuilt in the 11th century under King Robert II the Pious. There remains no visible trace of King Robert’s church. During the 12th century, the Romanesque tower of the chevet was erected, which is still visible today. (It was formerly surmounted by a spire that was torn down around 1754 and replaced by the current balustrade). Since the portal was falling into ruin, the building was again rebuilt at the end of the 13th century in the reign of Philip IV the Fair; the central nave from this period survives, as well as the first aisle of the choir, the sides of the right flank of the nave, and the portal. The appellation “Saint-Germain-l’Auxerrois” dates from this time. It became the preferred church of the royal family when the Valois installed themselves again at the Louvre, in the 14th century, dethroning Saint-Barthélémy on the Île de la Cité as the parish of the kings of France. At this time the western portal, choir, and Lady chapel were erected. From 1420 to 1425, the central nave and the side aisles of the nave, except the Lady chapel, were rebuilt. From 1431 to 1439, the master mason Jean Gaussel built the porch and the chapels of the left flank of the nave. In 1541, a magnificent rood-screen was constructed following the plans of Pierre Lescot, which was later destroyed, in 1745, during the “screenoclasm” fad that struck France and Paris in particular. Molière was married here on 20 February 1662 and Rameau on 25 February 1726. 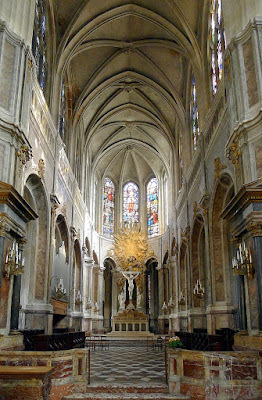 The 18th century saw efforts to update the church according to the tastes of the day: in 1728, the stained glass windows were replaced by grisailles, and in 1756, the architect Claude Bacarit and his brother-in-law, the sculptor Louis-Claude Vassé, classicized the church choir, which was adorned in 1767 with gates by the locksmith Pierre Deumier. At the beginning of the Revolution, after the forced return of the royal family from Versailles to the Tuileries Palace, the future Louis XVII made his first communion here. 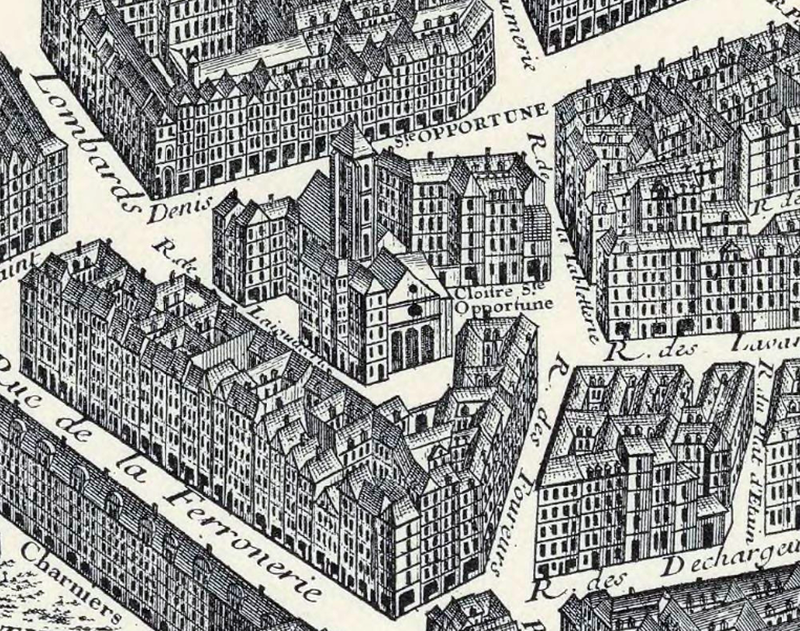 During the Terror, Saint-Germain-l’Auxerrois was emptied of its furnishings and made into a barn, then into a printing press, then a police station, and finally a saltpetre factory. In 1795, it was profaned by a Theophilanthropic ritual. The church was returned to the true worship in 1802, and restored by Jean-Baptiste Lassus and Victor Baltard between 1838 and 1855. 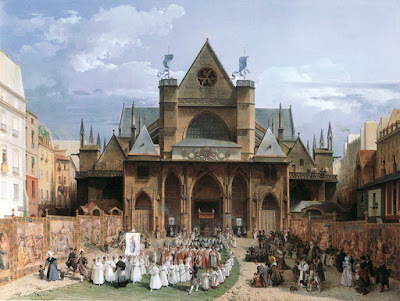 It was actually able to escape destruction by Baron Haussmann, a Protestant who feared that he might be reproached for ordering the demolition of such an emblematic historical edifice, the place from which the signal was given that set off the events of St Bartholomew’s Day. Nevertheless, after the demolition of the old buildings that surrounded it, a very large space was cleared on the side facing the colonnade of the Louvre, but the church was effectively set in a recess on one of its sides, ruining the appearance of the area.To restore a sense of equilibrium, Haussman asked the architect Jacques Hittorff to erect a building inspired by the religious edifice on the opposite side of the space, to house the town council of the 1st arrondissement. Hittorff reproduced the principal façade of the church almost identically (a porch surmounted by a rose window) which he flanked with constructions in the style of the era. Between the old church and the new town hall, Théodore Ballu, winner of the 1840 Prix de Rome, built a bell tower (or belfry) in the flamboyant neo-Gothic style, attached on each side to the two other buildings by two doors in the same style. Begun in 1858, this architectural ensemble was finished in 1863 and it remains the state we know today. 12. Wednesday of the Fourth Week of Lent: station at the collegiate church of Sainte-Opportune rue Saint-Denis (Sancta Opportuna in vico Sancti Dionysii). The foundation of this church goes back to a chapel dedicated to Our Lady of the Woods, built during the Late Empire, a time when the northwest part of Paris was still covered by the forest of Rouvray, of which the ‘Bois de Boulogne’ park is a vestige. During the 9th century, the bishops of Sées in Normandy, chased away from their region by the Vikings, sought refuge in Paris and placed in this church the relics of St Opportuna (a rib and an arm), abbess of the Abbey of Almenêches, near Sées, who died in 770. Miracles attributed to the intercession of the Saint multiplied there, and the church soon became a place of pilgrimages. After Louis the Stammerer (846-879) donated the adjoining lands on the north (the Champeaux, that is to say, the current Halles), the chapel was replaced by a church surrounded by a cloister, and a chapter of canons was founded. During the 12th century, Sainte-Opportune became a parish church over a rather limited territory. Louis VII (1120-1180) granted this church feudal jurisdiction over all the meadows and woods up to Montmartre. The church was reconstructed during the 13th and 14th centuries. Suppressed and nationalized in 1790, it was sold on 24 November 1792 as a stone quarry and quickly destroyed. Its memory subsists in the Sud des Halles in the names of the Rue Sainte-Opportune and the Rue des Lavandières-Sainte-Opportune, as well as in the Place Sainte-Opportune, which occupies the site of the old cloister; a little statue of the Saint still adorns one of the façades of the latter. 13. Friday of the Fourth Week of Lent: station at the collegiate church of Saint-Merri rue Saint-Martin (Sanctus Medericus in vico Sancti Martini). This was once the site of the old oratory of Saint-Pierre-des-Bois. St Medericus (of whose name “Merry” or “Merri” are variants), abbot of Saint-Martin in Autun, had come there while on pilgrimage to Paris to see the tombs of St Dionysius and his companion, St Germain of Autun. Tired and ill, he chose to settle on the right bank of the Seine in a poor hermitage situated near this chapel of Saint-Pierre-des-Bois; he died here on 29 August 700 and was buried in the chapel. Numerous miracles took place at his tomb, such that in 884, Joscelin, bishop of Paris, had his remains exhumed and placed in a reliquary. (The elevation of relics over the altars was the form for the canonization of a saint at that time). During the 10th century when the chapel had become too small and was falling into ruin, it was rebuilt and transformed into a basilica by a royal officer, Odo the Falconer; during the reconstruction of the church in the 16th century, the skeleton of a warrior wearing gilt leather boots was discovered in the old cemetery, with the inscription “Hic jacet vir bonae memoriae, Odo Falconarius, fundator hujus ecclesiae.”) St Medericus then became the patron saint of the right bank of the city. Around 1010, the bishop of Paris, Renaud of Vendôme, gave it over to the cathedral chapter; it thus became a collegiate church, served by a community of seven canons from the cathedral chapter and led by a chevecier. They all had to swear an oath of fidelity to the cathedral chapter, were bound to reside in the cloister, and had to be ordained priests if they had care of souls. Together with Saint-Sépulchre, Saint-Benoît-le-Bétourné and Saint-Étienne-des-Grès, Saint-Merry was thus one of the four “daughters of Notre-Dame”, and the only one that survives today. In 1200, the church was made into a parish under the name of Saint-Merri and its curé was a cardinal of Paris; the Italian writer and poet Boccaccio, and St Edmund, future archbishop of Canterbury, were both parishioners. The current building was built between 1515 and 1612. The crypt, nave, and aisles date from 1515-1520, the arms and crossing of the transept from 1526-1530, the choir and the apse—the work of the master mason Pierre Anglart—were finished in 1522, while the works were concluded in 1612, when the bell tower was raised by a level. (A fire in 1871 destroyed this third level.) As happened with Saint-Germain-l’Auxerrois, the 18th-century saw efforts to update the church according to the tastes of the day, with some real success: the rood-screen of 1558 was destroyed in 1709 (one of the first manifestations of “screenoclasm” in the capital). A vast Communion chapel was erected in 1743 by Pierre-Louis Richard, following plans by Gabriel-Germain Boffrand; this chapel was originally separate from the church, but Richard made a path between the two buildings in 1760. In 1759, the brothers Slodtz were charged with considerable modifications of the choir, whose pointed arches were curved and covered, like the pillars, with a veneer of marble and stucco. The floor was covered with a magnificent marble paving, the furniture was renovated, and the stained-glass was in part replaced with grisailles. Closed in 1793 by the Revolution, the church became a saltpeter factory. Between 1797 and 1801, the Theophilanthropes transformed it into a “temple of Commerce”. It was finally returned to true worship in 1803. On October 2013, Saint-Merri was enrolled in the World Monuments Fund’s list of monuments at risk. Its ornaments, classed as historical monuments, are today in serious danger.